How can Cosatu remain releveant in the face of declining membership and a failing formal economy? 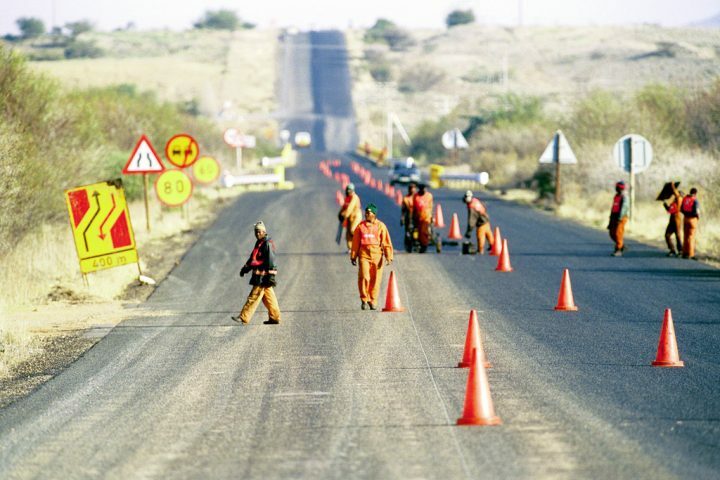 Roadworkers undertaking repairs in South Africa’s Northern Cape. Image by Trevor Samson via Flickr. The union federation faces financial difficulties, due to its declining membership and collapsing affiliates. The start of the congress was marred by protests by disgruntled SA Municipal Workers Union (Samwu) members, excluded for “not being in good standing” (due to outstanding affiliation fees). Citing longstanding “organizational challenges,” Cosatu formed a task team to intervene in the troubled Samwu, as well as in the SA Transport and Allied Workers Union (Satawu) and the Chemical, Energy, Paper, Printing, Wood and Allied Workers’ Union (Ceppwawu). In its organizational report to Congress, Cosatu leadership lamented serious membership losses: Satawu has lost over 100,000 members and Samwu about 30,000. To compound this crisis the federation has experienced a serious hemorrhage of industrial workers, becoming increasingly reliant on recruitment among white collar public sector workers. Admitting his responsibility for some of Cosatu’s troubles, outgoing president S’dumo Dlamini claimed that the greed of some leaders has “sucked blood” out of federation. He admitted that since 2015 they had lost almost 320,000 members, a number significantly more than the total membership of their biggest affiliate, the National Education, Health and Allied Workers’ Union (Nehawu), which claims 275,000. Given notoriously unreliable union membership figures, the real losses could be even bigger. However, the real reasons for Cosatu’s decline are a bit more complicated. Cosatu was a powerful force in the post-1994 ruling tripartite alliance, mobilizing the movement’s big battalions for elections and acting for some time as an important countervailing force against rightward government policy shifts under Mandela, Mbeki and finally Jacob Zuma. But much of its leadership had begun to view the federation as a mere conveyor belt to positions in government. It’s ambivalence over the massacre of striking miners at Marikana in August 2012, the most lethal use of force by South African security forces against civilians since 1960, and the vote in 2016 by its central executive committee to expel 340,000 members Numsa, its most militant affiliate, marked new low points.